Ο ΚΑΡΑΜΟΥΖΗΣ ΒΡΑΒΕΥΣΕ ΤΟΝ ΚΑΡΑΜΟΥΖΗ ! With big companies turning their routes to Turkey again, Ege Port in the Kuşadası region of the Aegean province of Aydın, where the highest number of cruise ships anchor annually, is expected to host 195 cruise ships this year with 170,000 tourists. Ege Port General Manager Aziz Güngör said bookings for 2020 in cruise tourism are going well, adding that it is pleasing for the industry to see that big companies have directed their routes to Turkey again. 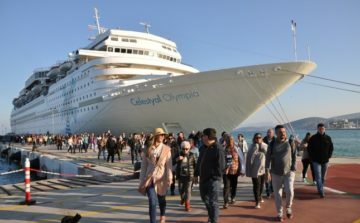 Güngör’s remarks came after the second cruise ship of the season, the Maltese-flagged Celestyal Olympia cruiser dropped anchor at Ege Port in Kuşadası with 1,540 passengers on Saturday. In mid-February, Black Watch, which operates under a Bahamas flag, departed from the U.K.’s Southampton port carrying 550 passengers and docked at Kuşadası. Some of the tourists on Celestyal Olympia, consisting mostly of American tourists, used the opportunity and visited archaeological sites such as the historic sites of Ephesus and the House of Virgin Mary, while others preferred to shop in the downtown area of the city. 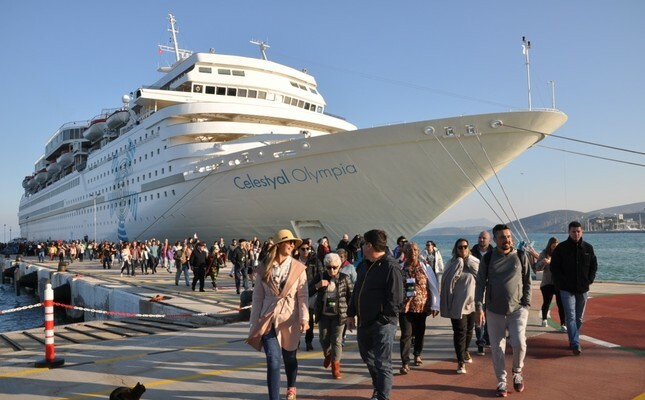 Güngör said that Celestyal Olympia would cruise 60 times and carry approximately 87,000 tourists to the province during the season. According to Güngör, 58.7 percent of cruise ships coming to Turkey last year anchored in Kuşadası.